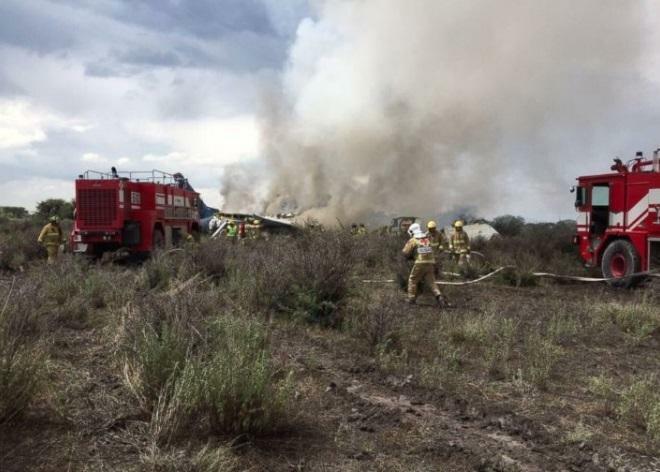 An Aeromexico Embraer passenger jet has crashed shortly after taking off from Mexican state Durango. Mexico officials are reporting as many as 85 people were injured in the crash, two of them critically, but no fatalities have been reported. The Embraer is a mid-sized jet that had 97 passengers and four crew aboard when it crashed around 4 p.m. local time, according to Gerardo Ruiz Esparza, Mexico’s minister for communications and transportation. Governor Jose Rosas Aispuro said in an interview on local news, "The plane was taking off" when witnesses told him there was "a bang" and then suddenly the plane was on the ground. Miraculously no one was killed in the crash. Video taken of the crash site shows the severely damaged wreckage of the plane after it screeched to a halt in scrubland. A plume of smoke can also be seen rising into the sky, and it is a wonder that anyone survived at all. The Embraer plane tried to make an emergency landing about six miles away from the airport, according to a spokesman for the state’s civil protection agency named Alejandro Cardoza. Cardoza confirmed at least 85 had been injured in the crash and the resulting fire from the crash had been extinguished. The state health department said two of the injured passengers were in critical condition. An official from Durango airport said preliminary reports suggest the crash has been attributed to bad weather conditions. One passenger told local news Televisa that shortly after takeoff it felt like the plane was hit by a strong air current. "Many managed to leave the plane on foot," Cardoza added. Aeromexico confirmed on Twitter that the flight number of the Embraer aircraft bound for Mexico City was 2431. [email protected] blueprints for the 3D printed guns being taken down because the judge's restraining order! !… LMMFAO! !